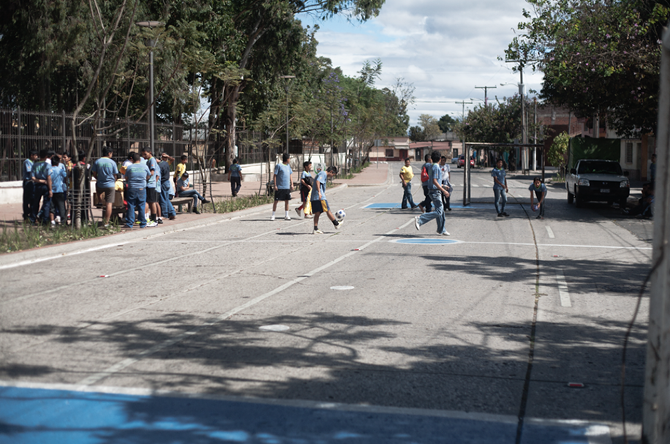 How can municipalities provide poor neighborhoods with a small number of public spaces that supports quality activities access to public parks and open space and provide opportunities for the urban youth? Moving away from car-centric urban planning and rethinking the role of the street in the city has only recently become a serious consideration, and the vast majority of streets worldwide remain intimidating places for anything other than a car. 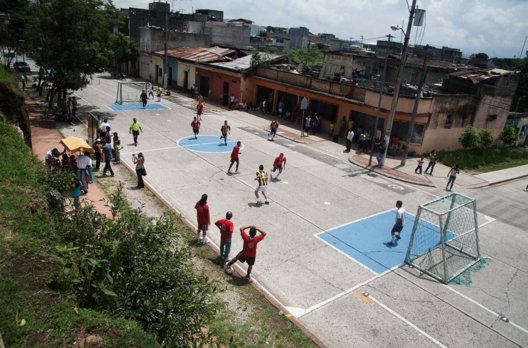 With the city government unable to provide ample open and public spaces in Guatemala City, the Bureau of Public Interventions, a collaborative project, originated as a direct response to these lack of infrastructural amenities for recreation and socialization. 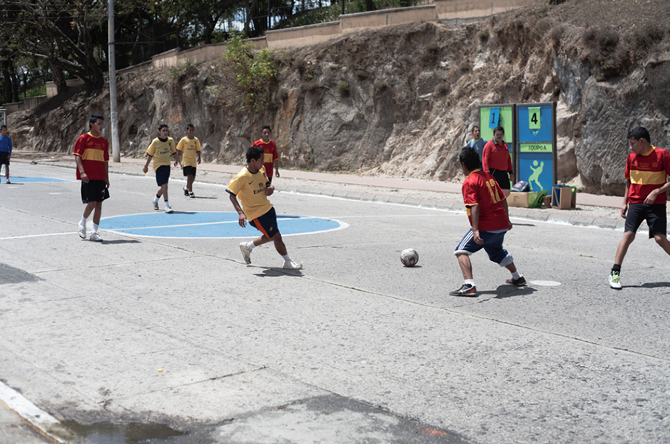 Incorporating urban interventions by changing the street into pick-up soccer fields, they have successfully modified the way in which citizens relate with the open spaces and have engaged the youth to experience a positive part of the built environment. Sometimes all that is necessary is to create a good public space is to make people feel better about living in the city and redefine the importance of the public realm. With a Gamechangers grant from Nike the design team worked with the municipality and the community to design and construct two low cost “pilot” street football pitches in different low-income residential areas around the city. The proposed sites for the fields are to be low-traffic city streets. By changing what occurs in the street, we can start to make smarter approaches to urban planning and a more holistic interpretation of a city. Architecture for Humanity, Guatemala City, Buró de Intervenciones Públicas (BIP), Stefan Benchoam and Christian Ochaita, Nike Gamechangers Program, community members, urban youth. 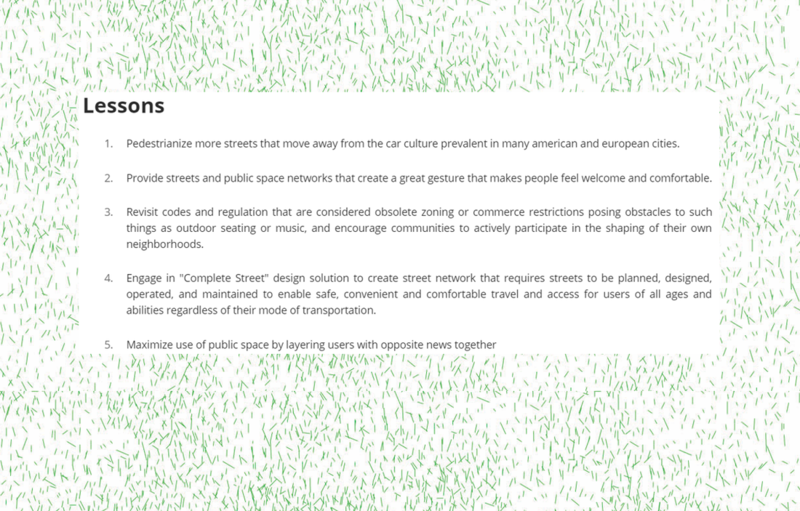 Environmental: transforms streets into low-traffic networks, reduces pollution, and incentivizes exercise.